Taking the time to "look up and exhale" can be a bonding experience — even a spiritual one — for the entire family. In all likelihood, star gazing has been a human tradition since there were humans and, despite the pull of technology, it remains a great way to spend a night outside — anytime of the year. On a clear night, any low-populated location can provide good viewing opportunities. 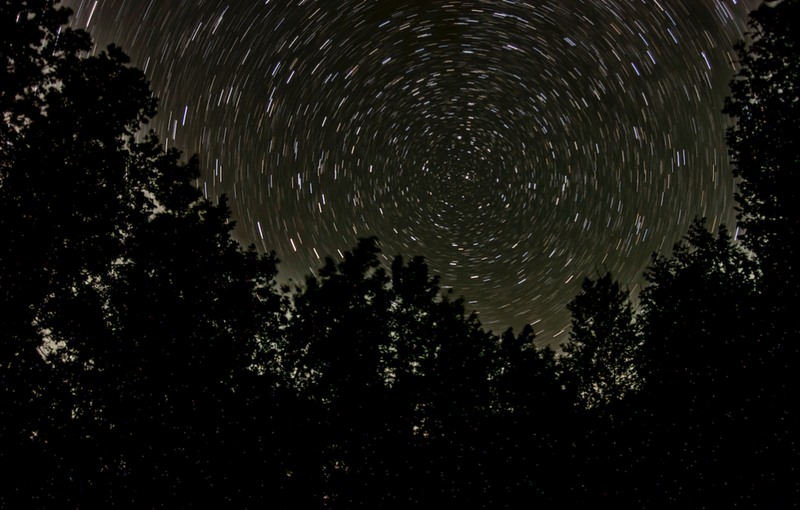 But if you really want to experience the heavens the way our ancestors did, head for one of Michigan's designated dark parks for optimal viewing. Depending on your destination, some effort may be required if you are looking for optimal darkness. For instance, visitors to the Negwegon State Park in Harrisville, have to hike about five miles to reach the designated dark sky area but, on a clear night, it is well worth the effort. If you are not prepared for a five mile hike, The Headlands International Dark Sky Park in Mackinaw City is more accessible. Humidity can obscure visibility so cooler air — which tends to be a little more dry — can improve visibility. This should also go without saying but, be sure to dress appropriately. Nights are cooler than days but many people are not prepared for the significant drops in temperature. To be safe, layer up. Bring gloves, a hat, a jacket, perhaps even blankets — depending on the season. Flashlights interfere with your night vision and should be turned off, if possible. Many city dwellers are surprised by how well human eyes can adjust to the dark after just a few minutes. If you must use a light, better options include headlamps or flashlights with red light selections. Our eyes are less sensitive to red light, so it's best for preserving night vision. If you’re just arriving and your eyes haven’t adjusted yet, try sitting or laying down for a few minutes with your eyes closed. This can be kind of fun because, when you open your eyes, you’ll see nothing but the stars. For the best experience — plan ahead, locate your destination on a map before heading out, and bring plenty of common sense. Equipment: Expensive equipment is not required to photograph the stars and Milky Way. With a reasonably-priced DSLR, you can easily shoot photographs that will leave you in awe. For optimal results use a wide angle lens. Also, most DSLR cameras come with a “kit lens” which is a general purpose 18-55mm (set your lens to 18mm). Bring along a sturdy tripod, as clear long exposures are impossible otherwise. One challenge most people face is focusing. An easy way to lock in your focus is to autofocus as far as you can during daylight hours. Then, wrap your lens with a rubber band to hold it in place and switch it to 'M' for manual. Experiment with your settings and exposure times, keeping in mind that lower ISO settings result in a more dynamic range of colors. And setting it as low as you possibly can means extraordinary images. Aperture can be tricky too; I don’t always recommend the most open settings, as most telescopes are around f8. I tend to stick to f4 because it results in a tighter image. Location: The best results will obviously come from a complete lack of light pollution. Dark Sky Preserves are great for this, but you aren’t limited to them. If you can look up and see the Milky Way, you can shoot it. With long exposure times, our cameras see more than we do and, sometimes, surprising details are captured. Conditions: Clear skies are generally preferred but even with some clouds, every now and then, you can get lucky and an interesting image emerges. You’ll also want to watch out for the moon, which acts like a gigantic spotlight. If possible, avoid a full moon and opt for a crescent moon instead. Patience: Take lots of photos and don't be afraid to experiment. Andrew Burd is a photographer based in Midland, MI. Learn more about his work at anomalyfilmworks.com.